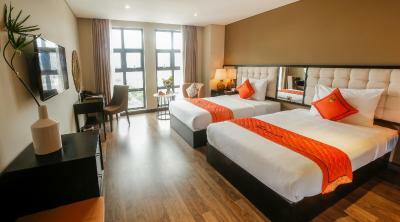 Lock in a great price for Sanouva Da Nang Hotel – rated 8.8 by recent guests! Everything. The best hotel on this trip. Got a special deal that included free massages each day. The buffet breakfast had such a variety of Asian and Western dishes. The staff is so helpful and everyone cared so much about you. The hotel is lovely and we felt like a king and queen there. The hotel is in the city center. If you visit Danang make sure to see the dragon bridge and the show there at 9pm Saturday and Sunday nights. Ask the reception to book you space on the boat that leaves from the "tail" end of the bridge. Take a break at My Khe Beach ("China Beach") especially about 4pm when Vietnamese families arrive. Nice decoration, good location, service-mind staffs and good taste breakfast. 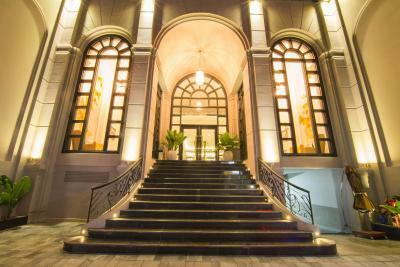 Location is wonderful, nearby the Han market and Da Nang church. Staffs are warming and willing to help. The room is comfy, as the decoration is grace and antique. Highly recommended. 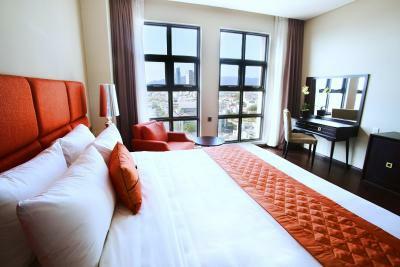 The Sanouva, Danang, is an upscale hotel less than five years old. 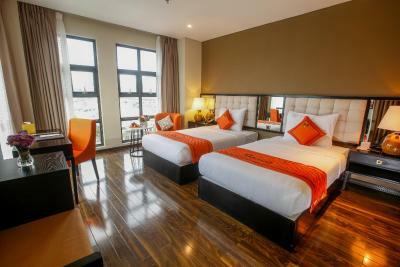 It offers large rooms with modern facilities and a spa on site. 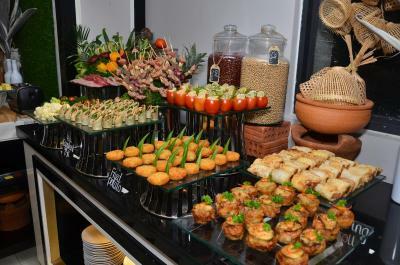 The buffet breakfast has a large choice of Vietnamese and western specialties and will not disappoint. If you need help with information about local activities, see Customer Relations manager, Lua. She has many interesting options for things to do in and around Danang. Beru convenient for walking to river and restaurants! Breakfast buffet was wonderful and staff were always ready to help. The staff were very courteous and accommodating. The property is in a good location as it is accessible to most places. 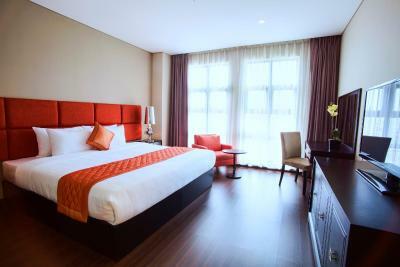 Sanouva Da Nang Hotel This rating is a reflection of how the property compares to the industry standard when it comes to price, facilities and services available. It's based on a self-evaluation by the property. Use this rating to help choose your stay! One of our top picks in Danang.Rising high in Hai Chau District, Sanouva Da Nang Hotel features views of the sea, river, mountain and city, and houses a restaurant. Guests also have a good work out in the fitness center, pamper yourself with soothing massage, or enjoy a sauna session. Free WiFi access is offered. Rooms and suites feature a flat-screen TV, an electric kettle and a mini-bar. The private bathroom comes with shower, toiletries and a hairdryer. Guests can use the business center, or make travel arrangements at the tour desk. Staff at the 24-hour reception can assist with airport shuttle, laundry, car rental and ironing services. The hotel is 2,950 feet from Song Han Bridge and 2.9 mi from My An Beach. Da Nang International Airport is 1.9 mi away. S'Ngon, located on the 3rd floor of the hotel building, serves daily buffet breakfast with an array of Vietnamese and international dishes. Room service is possible. This property is also rated for the best value in Danang! Guests are getting more for their money when compared to other properties in this city. 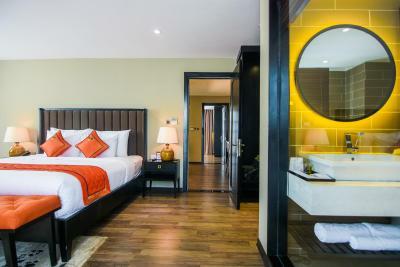 When would you like to stay at Sanouva Da Nang Hotel? This room features a electric kettle, fireplace and flat-screen TV. 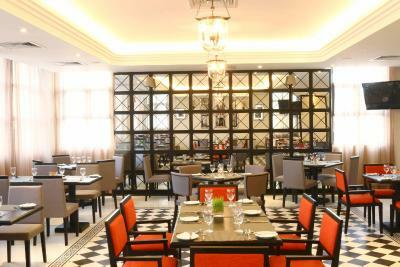 Guests can enjoy a 3-course Vietnamese dinner (set menu) for 2 people if you choose 'breakfast and dinner' rate category. Guests can enjoy a 3-course Vietnamese dinner (set menu) for 3 people if you choose 'breakfast and dinner' rate category. This room has air conditioning, fireplace and mini-bar. This room features a dining area, fireplace and mini-bar. 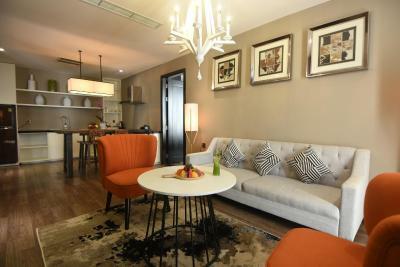 This suite has a dining area, flat-screen TV and sofa. This apartment features a sofa, dining area and view. Guests can enjoy a 3-course Vietnamese dinner (set menu) for 4 people if you choose 'breakfast and dinner' rate category. This apartment has a seating area, cable flat-screen TV and mini-bar. This room has a seating area, cable flat-screen TV and mini-bar. This suite has a seating area, cable flat-screen TV and mini-bar. This suite has a seating area, cable flat-screen TV and private bathroom. This room has a seating area, cable flat-screen TV and private bathroom. Located right at the city centre, Sanouva is the best chooice for bussiness man and tourists. The blend well between contemporary and antique style, the decoration and the lasted equipment which all toghether make Sanouva hotel to be difference. House Rules Sanouva Da Nang Hotel takes special requests – add in the next step! Debit card Sanouva Da Nang Hotel accepts these cards and reserves the right to temporarily hold an amount prior to arrival. Sanouva Da Nang Hotel accepts these cards and reserves the right to temporarily hold an amount prior to arrival. Please inform Sanouva Da Nang Hotel of your expected arrival time in advance. You can use the Special Requests box when booking, or contact the property directly using the contact details in your confirmation.